The waterways, farms, and vineyards south of Sacramento make for a pretty Sunday drive, sure. But slow down to a biking pace, and the area becomes downright spectacular. Best way to do this? 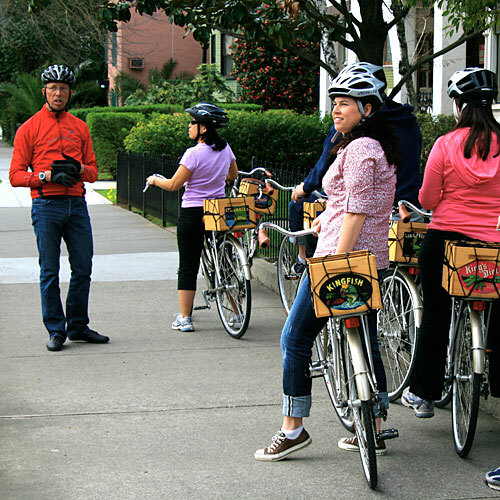 Fast Eddie Bike Tours' three- to four-hour guided rides on ultra-comfy Raleighs tricked up with old produce boxes for bike baskets. You'll breeze by river vistas and historical sights, stopping to load up on irresistible mac 'n' cheese at Husick's Country Store or burgers at Dinky Diner, and do some wine tasting. The waterways, farms, and vineyards south of Sacramento make for a pretty Sunday drive, sure. But slow down to a biking pace, and the area becomes downright spectacular. Best way to do this? Fast Eddie Bike Tours’ three- to four-hour guided rides on ultra-comfy Raleighs tricked up with old produce boxes for bike baskets. You’ll breeze by river vistas and historical sights, stopping to load up on irresistible mac ‘n’ cheese at Husick’s Country Store or burgers at Dinky Diner, and do some wine tasting.